Just feels like you're walking into the water. 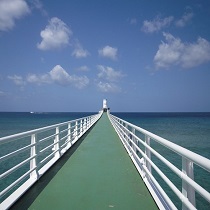 Okinawan coral reef and tropical fish down the observatory as well as unique whale shaped glass boat!Northern Okinawa's Busena cape which is famous for its high transparency and Okinawa's only one under-water observatory that sticks out for 170 meters from the cape. The natural under-water world can be seen from the windows 5 meters down in the water. Playful whale shaped glass boat is available and will be a great experience for kids! About 60km--90 minute--using National Highway #58 from Naha Airport / About 75 minute from Naha IC to Kyoda IC using the Okinawa Expressway, about 75 minute. About 20 minutes for the glass-bottom boat. You can spend as much time as you want observing in the underwater tower (but you cannot enter again after exiting). 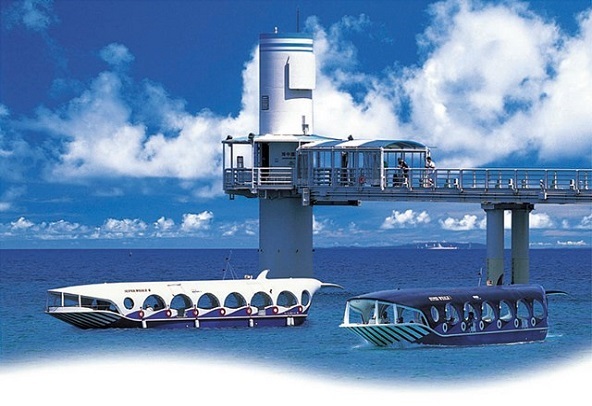 If you do both the boat tour and the underwater observatory tower, it will take you from one hour to an hour and a half, including the time it takes from and to the parking lot. 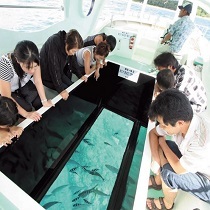 *You have to descend a steep spiral stairway (50 steps) to enter the underwater observatory tower, and you have to walk across a floating pier to enter the glass-bottom boat, so be certain to confirm in advance concerning people who have difficulty walking, pregnant, and people accompanying small children. *There is a restaurant in the next-door “Busena Terrace Hotel.” Please refrain from eating boxed lunches, etc. and drinking inside the facilities. 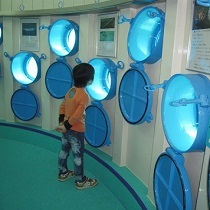 Inside the underwater observatory, you can enjoy the beautiful world of Okinawa’s sea with your clothes on. 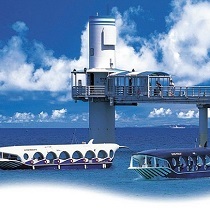 If you are one who has given up visiting Okinawa’s sea due to bad weather, why don’t you come to visit this underwater observatory, where you can enjoy peering into the sea at ease even on rainy days? From the windows on the observatory floor 5 meters below the ocean surface, you can gaze out at the sea bottom covered with a coral reef around which brilliantly colored tropical fish and other fish swarm! 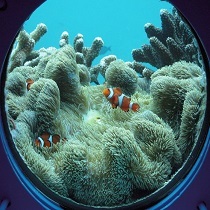 The 24 window panes afford a 360 degree view, so you can even follow your favorite fish all the way around!? 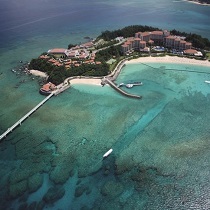 The Busena marine park is located in Okinawa Kaigan Quasi-National Park. which is home to tropical fish of many different colors. 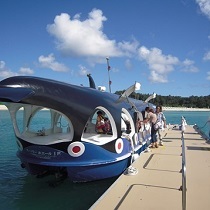 Ride this glass-bottom, whale-shaped boat to take an underwater cruise in the offing. 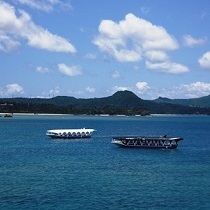 We feel certain that you will find the view of the Okinawa sea particularly beautiful from this glass-bottom boat! The ride is sure to create lasting memories of your vacation, so please try it!